From their effortless studio sessions, to touring Europe as a tight-knit combo, Chasing Kurt bring a touch of class to house music and represent a prime example of how the new generation are pushing the music forward. 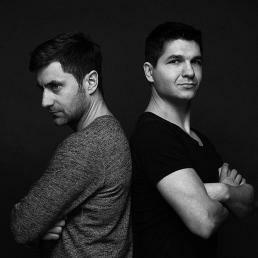 Made up of vocalist Lukas together with DJ & producer Wojtek, Chasing Kurt have cultivated a sound that is both accessible and deep, sublime yet dancefloor-ready and wholly captivating. In the few years they’ve been together they have amassed a strong back catalogue of work, and continue to work on new compositions on a daily basis, travelling all over Europe with their superlative live act and DJ Set. It all began in 2009 when the group’s vocalist Lukas Poloczek was working in a bar where Wojtek Kutschke was DJing. It happened that everyone at the bar refused to leave, even when Lukas tried to disperse them and so he resorted to singing at them (a talent he’s had since his youth). Wojtek was impressed by what he heard and immediately invited Lukas for a studio session with Pascal, with whom he’d already been working on music. 2016 Pascal has left the band to realize his own projects. The connection between the three men, a close bond was formed immediately and they produced more ideas, more songs, and a deeper understanding of hier own sound; always open for new styles. These formative sessions resulted in their first releases, including ‘Money’, which was discovered by Maya Jane Coles for her DJ Kicks mix on !K7 Records and helped to establish Chasing Kurt as one of the foremost deep house groups in the business.